In the depths of the ocean discovered an amazing volcanic world. Volcanic lost world discovered by scientists in the depths of the ocean. Experts from the Australian State Association for Scientific and Applied Research (CSIRO) made a discovery while mapping the seabed 400 km east of Tasmania. Seamounts rise to a height of 3 km from the seabed, but even the highest peaks are located 2 km below the waves. 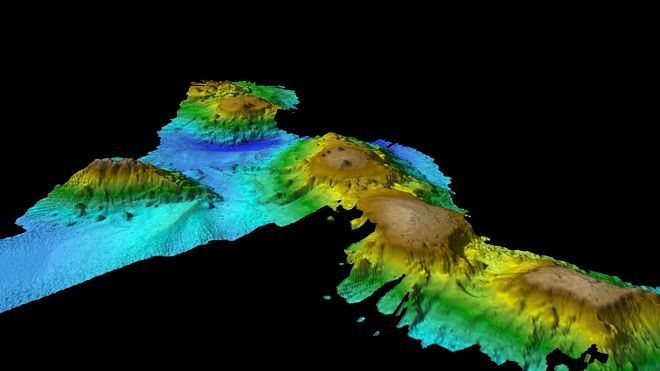 “Multibeam mapping made it possible to see in vivid detail a chain of volcanic seamounts rising from the abyssal plain at a depth of about 5 km,” said Dr. Tara Martin from the CSIRO team. Mountains differ in size and shape: some have sharp peaks, while others have wide flat plateaus on peaks, dotted with small conical hills formed as a result of ancient volcanic activity. Scientists believe that seamounts can be an important “stopping point” for some migratory animals, such as whales, who can use these local features for navigation. Additional exploration of the area will be carried out during expeditions scheduled for November and December.